It is no wonder that so many people recognise and love the Moreton Bay Fig tree. The botanical name is Ficus macrophylla and this is not a tree that is a long term prospect for the average suburban yard, however for larger gardens and parks it has no equal. This is a long lived spreading tree that will reach a good height over time. Easily recognised by the strongly buttress trunk, the bark is an unremarkable grey, the foliage deep green and glossy, however it is the overall impact of the tree that makes it so remarkable. 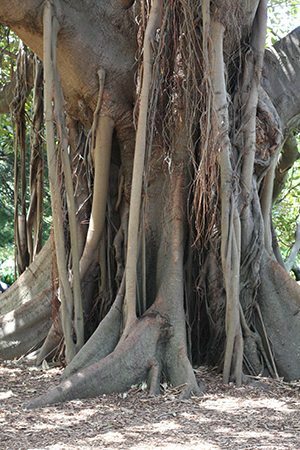 Probably the best known Australian Ficus species the Moreton Bay Fig can grow to 60m, the ariel roots that drop to the ground are distinctive. It is interesting to note that despite its potential size the Morton Bay Fig is popular as a bonsai specimen. Some excellent specimens of both species can be found in the grounds of The University of Sydney. The natural growth habit can be fascinating, in many circumstances it commences life in the canopy of other rainforest trees and as its root system reaches for the ground it ‘strangles them’. Originally found from the Atherton Tablelands in Queensland through to central New South Wales, example can be found throughout Australia. It grows well as far south as Melbourne and also in Tasmania. It is a tree that grows better in areas with good soil, in warmer humid climates the tree will send down aerial roots, in cooler less humid climates this is less frequent. Growth rate is fast when the tree is young, slowing as it reaches 5 – 10 years. Spread – Crown will spread to 30 m on a mature tree in an open position. The fruit attracts flying foxes which can be a problem in urban areas. The fruit has been used as bush food however is not that tasty. Range – Grows well from Queensland, through New South Wales to Victoria. An iconic Australian native tree. We need to remember that the Moreton Bay Fig is not the only large growing species, Ficus macrophylla subsp. columnaris is an interesting species from Lord Howe Island, aerial roots drop to the ground and form a huge system of support. Wonderful example of this majestic tree can be found in parks and gardens around Australia and indeed around the world. The botanical gardens in both Melbourne and Sydney have outstanding specimens. The smaller growing Port Jackson Fig is a dense shade tree growing to 15m. Again, slow growing, but a magnificent specimens when mature.